Meow! The Basic Cat-Eye (& thoughts on Brian Griffin) – amandarobots. There are about a billion ways to go about achieving a cat-eye. I’ve got two ways that I do mine, depending on how much time I have and what kind of look I’m going for. Either way, the results are great — just one way is less fussy than the other. Since this is a basic winged liner tutorial, I’m going to go with the less fussy version and might make a post on the fussier version at a later date. Felt-tip liquid eyeliner pen — I really like the Stila All Day Waterproof Liquid Eye Liner*, and I actually got this one for free as a 100-point perk at Sephora. A nice drugstore option is the Physician’s Formula one, which is what I used before I got this one. It is important that it is felt-tip, however, because that is definitely easiest to work with when you’re just starting out. Black eyeshadow — This one is a discontinued Urban Decay one that I got on sale on Hautelook and depotted a year ago. 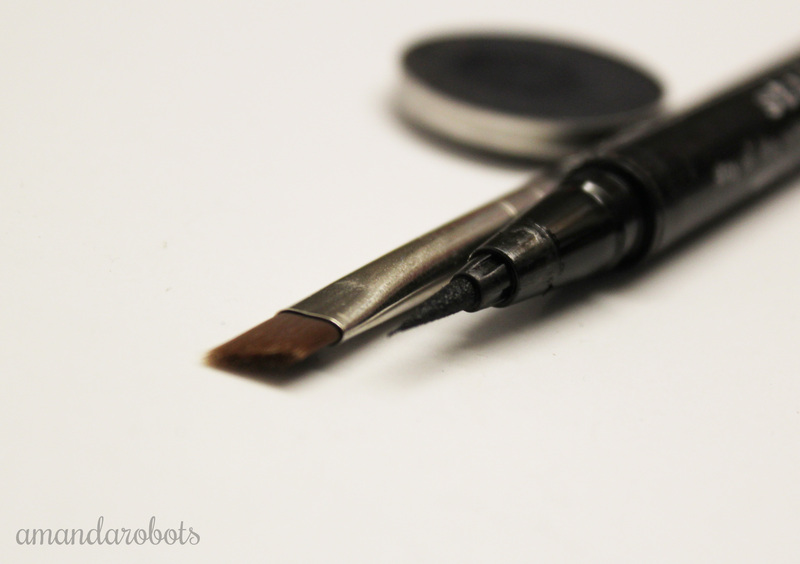 Angled eyeliner brush — Mine’s a MAC 263, which I love because it’s durable but also really thin. You can use anything though! A mirror — I use a desktop beauty mirror, but you can use a compact mirror if you like. It is best to do this sitting at a desk, however. A felt-tip pen gives you all the control. Check out the point on this one. A finer point = greater precision. 1. Sit still and look down into your mirror with your felt-tip liner in your dominant hand. Steady your elbow on your desk or table. 2. Gently press the side of the felt-tip as close to your lashline as you can, starting at the middle of your eye (above your pupil). 4. Gradually begin to thicken your line. The key to this is to use short, steady strokes, and to work from the center of the eye (above the pupil) out to the outer corner, then go back in and work on the inner corner. Follow the natural shape of your eye, but generally, a cat-eye looks nicest if the line is thinnest at the inner corner and thickens as you get to the outer corner, where the flick will be. 5. Speak of the devil! The flick is often the trickiest part. Working with short strokes, create a line from the very corner of your eye up towards the tail of your eyebrow. If you were to extend the line, it should eventually meet with the end of your brow. You can make this line as long or as short as you like. As you can see from the photos, I like to make mine quite short and angled upwards, as I find this gives my eye a more lifted look. Play around to find what you like best. 6. Now use a straight line to connect the smooth line you used to line your eye with the line you made as the basis of your flick. It should make a little triangle ‘>’ shape. 7. 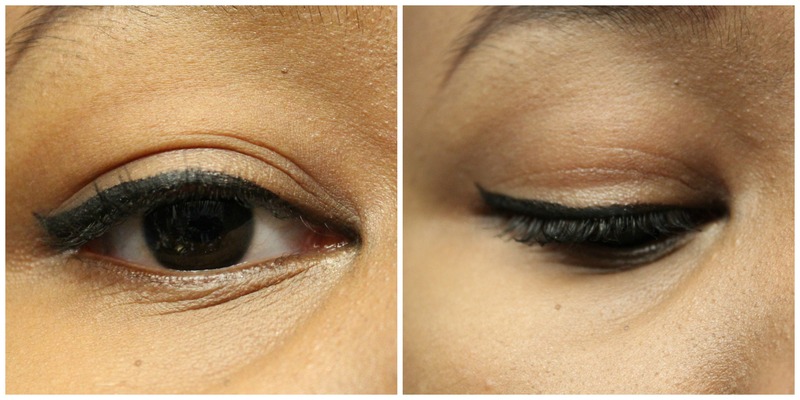 Smooth that triangle out, creating a smoother, more natural-looking wing. You can extend the point of it a bit to ensure that you don’t end up with a chunky little triangle! 8. 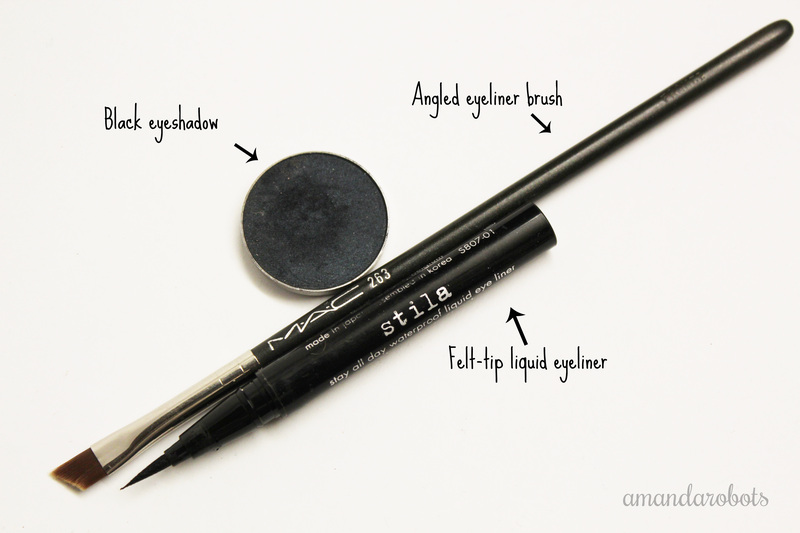 Ditch the liner and pick up your eyeliner brush and black eyeshadow. This step was a godsend for me when I was just learning. Dip the liner brush into the eyeshadow and use it to smooth over the cat-eye you created. The black shadow will go on and make a slightly wobbly line appear totally smooth. It’ll also help set your liner and keep it on all day! Do not attempt to practice this when you are in a rush. You will fail. And get frustrated. Do get lots of practice when you aren’t in a rush! You can use a Q-Tip dipped in some oil-free makeup remover like Bioderma to clean up any mistakes you make. …and can now conclusively say that it was the single un-funniest episode of a cartoon show I have ever watched. Killing off Brian seems to be a desperate attempt to keep the show fresh. Didn’t The Simpsons plan to do the same thing this year, until one of their voice actors died and things just sort of fell into place (terrible as it sounds)? I will not be watching Family Guy again anytime soon unless he comes back. Boycott. It’s over for me, dudes.